Learn to create and animate 3D text in Adobe After Effects software. 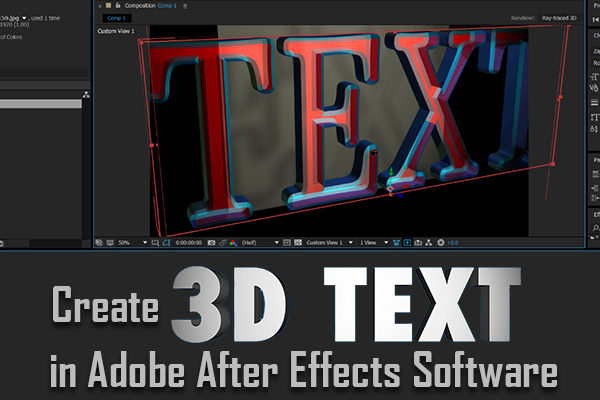 In this blog, you will learn how to make the great looking 3D text in Adobe After Effects software. In new composition, use the Type Tool to create the text. In this example, we use the word 3D, but you can use anything you’d like. Next, hop over to the character panel and adjust the typeface to your liking. Sans-serif fonts tend to look the best in 3D. 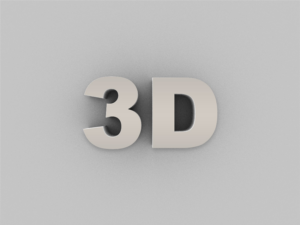 Use the Cinema 4D rendering to create the 3D text. If you are using Adobe After Effects CC, you have Cinema 4D Lite built in. Click on Composition > Composition Settings and click on 3D Renderer. From the drop-down menu, select Cinema 4D. Then open the options and set the quality down to 1. It will let you work faster in After effect, and then we can increase it before we render out the final 3D text. In Composition settings, select the 3D Layer icon within the Text layer. Your text is now controllable in 3D space, but the text itself is still flat. To get that traditional 3D look, you will need to add depth to the text. To do so, open up text composition layer settings, open up Geometry Options, and set the Extrusion Depth. It’s all about making the 3D look good, and lighting and texturing is the key to making it work. Go to Layer > New > Light In a Light menu, open the Light Type drop-down and select Spot. For now, let’s use regular white light. Set the color to white, increase the Intensity to 100%, set Shadow Darkness to 100%, and select the Cast Shadows. Click OK.
Go to Layer > New > Camera. Select a Two-Node Camera, and for this project, we will set the Focal Length to 30mm. Use the C button on the keyboard to cycle through the camera options. You can move, shift, and zoom the camera. We are going to rotate the camera and find a good look for 3D Text. Select the 3D Text layer and click on the A key twice. Now you will see all the 3D options in layer menu. Chance the Bevel Style to Convex, next exaggerate the look by adding more Bevel Depth. It allows the light to reflect off of text, rather than lighting a flat plane. Duplicate the spotlight with Ctrl+D on PC. Then click on the P key to open the Position settings. Set the light’s position to catch the extruded edge of text. In 3D text layer, under Material Options, turn Cast Shadows On. Select the first spotlight and click on A twice on the keyboard to open up the settings. Open the color panel and select the color of your choice. A little bit of color goes in a long way in 3D, so even a lighter shade will add some serious style. Do the same thing for the second spotlight, but this time selecting another complementary color. Next, Add some ambient light to 3D text. Set the Light Type to Ambient and Pick a Color. Go to Ambient light layer and click A twice, drop the Intensity way down. Now we want to add a rim light to text. You can instantly do this by duplicating the front spotlight. Click on P on the duplicated spotlight and set to position down and to the side of the text. In 3D text layer, navigate to the Material Options drop-down. Now play with Specular Intensity and Specular Shininess. Lightly adjusting these two settings will give you nice hot spots and reflections. Go to Layer > New > Solid and choose a color. And drag this solid to the bottom layer in the hierarchy. To have final control over the changes, create a new Adjustment layer. Go to Layer > New > Adjustment Layer and Drag Adjustment layer to the top of the hierarchy. Go to Window > Effects and Presets and in the Effects and Presets panel, search for Curves. Drag the Color Correction Curves effect into the Adjustment Layer. In the Curves menu, Make a traditional S-curve for some contrast. You can head into Blues and adjust them ever so lightly. If you want to bring this 3D text to live, then add simple movement in it. This is easy using the camera that we have already made. Go to Camera layer and click P for the position. Move the playhead to last second you want to animate. If you need a 2-second animation, move to 2, if you need 5, go to 5, etc. At that end, time add a position keyframe. Move on the playhead back to 0 seconds, and now well add the first move. Click C on the keyboard till you get the rotate tool. Move the text around till you find a position you are happy with as the start point. From here on you can add all types of effects, and other moves, but that’s all you need to know to get it started.